Sir Peter Maxwell Davies CBE, celebrated for his prolific and often unpredictable compositions, died a year ago this week. Master of the Queen's Music from 2004 to 2014 – the musical equivalent of poet laureate – he was also the wild child of contemporary music, delighting in pushing the boundaries to the extent that some of his earlier works were described as unplayable. And his early career was spent here on campus. 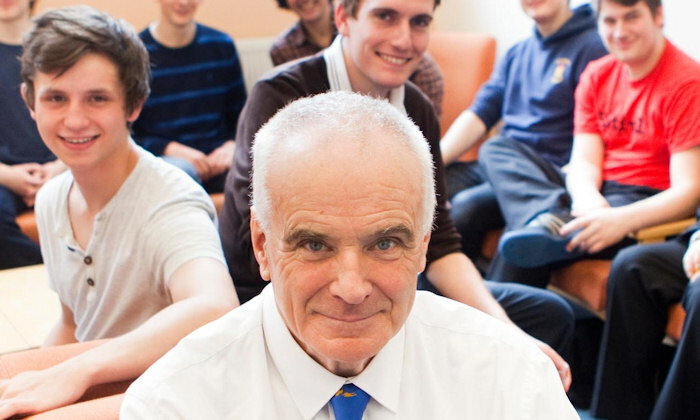 Maxwell Davies, known as Max, was born in Salford on 8 Sep 1934, the son of a factory worker. He was a musical prodigy as a child, taking up piano, and was 12 when his first composition was broadcast by the BBC's Children's Hour. He studied independently of his school, taught himself A-level music and reputedly astonished his examiners by demonstrating that he had memorised not only Beethoven's violin concerto but the composer's symphonies as well. He duly won places at both the Royal Manchester College of Music and The University of Manchester, where he teamed up with three other future composers: Harrison Birtwistle, Elgar Howarth and Alexander Goehr. Known as "the Manchester School", they set out to frighten the horses. One of Maxwell Davies's earliest compositions, a String Quartet, was submitted to the Society for the Promotion of New Music but rejected as unplayable. He was immensely prolific as a composer, but rarely predictable. Many of his early works were lurid, noisy, brutal and cacophonous. His music parodied and distorted medieval and Renaissance music or popular dance tunes, especially foxtrots. In one work a soprano singer dressed in a red nun's habit screamed through a loudhailer. Performances of his work were sometimes punctuated by cries of "rubbish" and "shut up" from the audience. Many walked out of the premiere of ‘Worldes Blis’ at a BBC Prom in 1969 although Sir Peter had his revenge. Before the second performance he put it about, "mischievously" he said, that he had revised the work, though in fact he had not. The critics said how much better the revised version was. Madness was a frequent theme in his early work, along with religion (or at least the religious music of the past) and the rejection of authority. Yet these uncompromisingly modern works went hand in hand with something more approachable – writing songs for children. Between 1959 and 1962 Sir Peter was head of music at Cirencester Grammar School, and began writing the first of many works for children. Throughout his life he remained interested in music education and in composing works for the young. He moved to Orkney in 1971 – and the islands had a profound mellowing effect on his music. "There is a wonderful soundscape of sea and gull noises and the wind in the heather, which has always stayed with me," he once said. "I didn't consciously set out to mirror them but they got in there. "I remember when I was writing the first symphony these extraordinary flute chords came through, and I didn't realise at the time but yes, those were the seagulls that I was hearing all the time." This more approachable music included his scores for two films directed by Ken Russell, The Devils and The Boyfriend, in 1971, the Violin Concerto of 1985, and one of his best-known works, An Orkney Wedding with Sunrise, which features Scottish and Orcadian folk tunes and bagpipes and was written in 1985. His most frequently-heard piece is probably Farewell to Stromness, a haunting lament for solo piano which is part of a musical "protest work", The Yellowcake Revue, first performed in 1980 when a uranium mine was planned in Orkney. In all he wrote ten symphonies, several operas, two full-length ballets Salome and Caroline Mathilde, 14 concertos and a cycle of string quartets. And there were several lighter works like Mavis in Las Vegas, inspired by his visit to the city and his detestation of the commercialisation of modern society. In 1986 he was knighted and in 2004 he was appointed Master of the Queen's Music. In 2009, he returned to campus as patron of The University of Manchester Music Society. "I have been criticised a lot for writing in different styles and different kinds of music," he said. "I've been called a prostitute. Fine. In that case, so was Mozart." Once asked, did he know who he was, he replied: "Every piece of music that I write, whatever its style, is a step on the way to finding out. No, I don't know, but when I've written the next quartet or the next choral piece or whatever it is I'll be that much closer to finding out. "And I hope in a way that I can never give you an answer in words, because I might stop writing music."